Hardcover: Alfred A. Knopf, 1994; Paperback: Vintage, 1995. 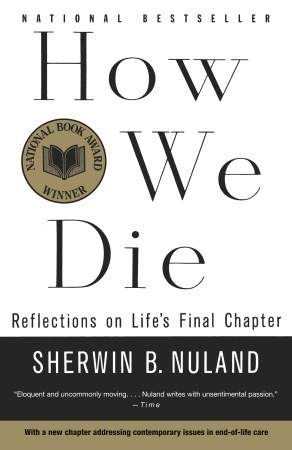 "Nuland is an exceedingly wise and experienced physician, who draws on a lifetime’s clinical experience; a scholar and historian who draws on all of Western literature; and a deeply sensitive (and, one feels, vulnerable) human being, who draws on many personal experiences of observing the dying of family and friends, and the sense of their loss. These three voices—the clinical, the historical, and the personal—all blend to produce a narrative, a series of portraits or analyses of dying, as powerful and sensitive, and unsparing and unsentimental, as anything I have ever read. I found this a formidable book—I could read only a little at a time. Nuland argues passionately against two of the evils of our times—the medicalization of dying (and of endless intervention) and the opposite, its eroticization and mythologization. Having read this book, I find my perspectives have altered—I have fewer illusions about dying, but also less fear." — Oliver Sacks, M.D. "A wealth of wisdom and experience presented in a wise and kindly voice. The stories echo in the mind long after reading. They are beautifully told." — Richard Selzer, M.D.